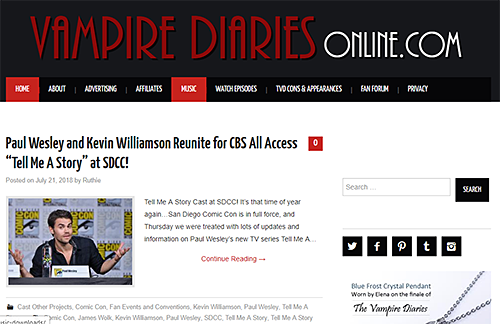 Fan Forum > Female Celebrities > Nina Dobrev > Please Welcome Our New Affiliate 'Vampire Diaries Online'! and feel free to visit this great site for lots of interesting posts relating to Nina, mainly her character on TVD, Elena Gilbert. You can find the link to the blog at the bottom of this forum and also on our affiliates page here under 'Nina Dobrev'. Welcome, Ruthie! Glad to have you and your site as an affiliate to the board! Ruthie welcome and will check out the site here in a moment! It has been a week. Going to untop this now. No, the communications team takes care of the affiliates. Though we are always welcoming of any recommendations if you come across ones.